TOKYO (AP) — Honda Motor Co. finally has its first product for the home packed with its prized robotics technology — a sensor-equipped lawn mower. Miimo goes on sale next year, in only Europe, where spacious lawns are often enclosed in gates, targeting 4,000 unit sales a year. The machine, which looks a bit like iRobot Corp.'s Roomba vacuum cleaner, continuously shaves about 3 millimeters (0.12 inches) off the grass, maneuvering itself on slopes. It won't break potted plants, goes to charge itself on its own and won't wander off. 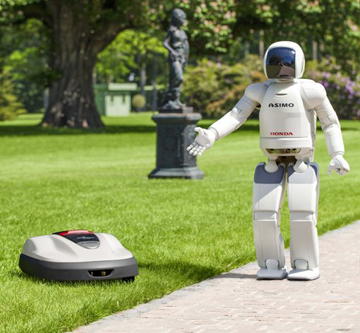 Honda robots, like its Asimo walking talking robot, have sometimes been criticized as impractical toys. Honda said Tuesday Miimo is a real product, selling for 2,100 euros ($2,600) to 2,500 euros ($3,000).